Sjösatt: riktigt snygg och välbyggd Isfjord, byggd av Pär Zackrisson! Som många andra byggare har jag nu blivit biten så det blir en balansgång mellan ett nytt bygge och paddling, men närmast blir det lite fälttest med packning och sommarens mål är en vecka runt Koster och lite senare en tur till Helgelandskusten, en dröm sedan några år. Mitt bygge startade i maj förra sommaren och jag blev klar ganska precis efter ett år. Dock har det gått en del perioder då det gått väldigt långsamt. Jag skickar även med några bilder om du vill lägga upp dem bland sjösättningsbilderna. That is beautiful workmanship. The glossy paint would show up even more clearly any small flaws in your construction. The colors you chose, beyond their clean, bright, cheerful effect and ultraviolet ray protection, provide good on-the-water visibility as well. That is very important in any crowded seaway, but maybe even more important in isolated places where motoring sailors don't expect to encounter other boats. Pär, it looks beautiful!! Very nice work. Björn, I have to agree. 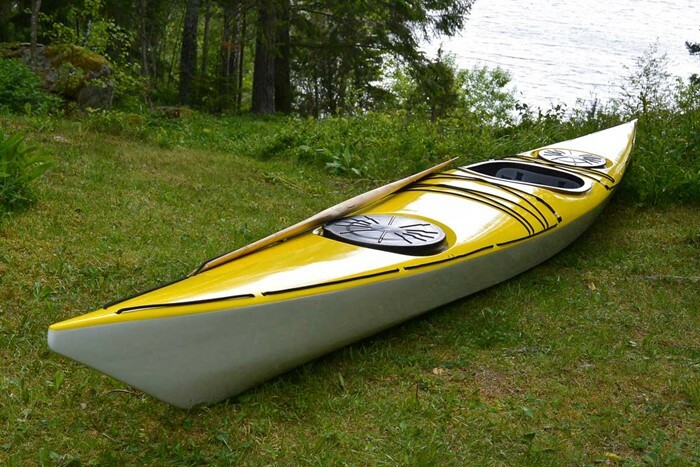 Of all the 30-odd kayaks I have built over the past 10 years (most being your designs), a majority of my customers wish to have them painted. It seemed crazy to me at first. Wood construction, either using wood strips or plywood stitch & glue, provides a means to get the kayak that THEY wanted. They are not struck with what the company behind a mass-produced kayak manufacturer thinks they would like. Paint, especially if one uses an automotive urethane system, provides access to a wide array of colors and effects. 1. I wanted a very quick building process, since it was a new, untried and experimental concept. With painting I did not have to spend much time on scarphs, joints and gaps between strips. In the end I managed well under 40 hours from cutting strips to launching – and the kayak is functionally intact, and still in use some 100 days a year. It performed so well that I is still the one BP I built. 2. I wanted a dark finish to emphasize the smallness of the kayak, and dark colors do just that, while light colors make things appear larger. 3. I also wanted the casual viewers to see the kayak, not the wood – and appreciate the pretty east-greenland lines, and not get stuck on the wood grain pattern. And to be frank: I was a bit frustrated by some of the appreciation: "Oh, a wooden kayak, how interesting. I built a grandfather clock last year. Wood is nice." Since I spend a lot of time on aesthetic qualities – lines, the relation between lines and surfaces, and overall visual harmony, the last point became important, and I have painted all kayaks since that first BP (except a deck with bright finish on the Sea Racer project). Another valuable advantage (since I use my kayaks hard) is that a painted kayak is easier to maintain – just a new coat of paint. Repairing scratches and dings in a bright finish is something else: the kayak will look a mess for several years, with the repairs considerable lighter than the darkened wood elsewhere. Regarding the paint my thoughts was that I didn't want the kayak to look homemade. Maybe after practicing with some more constructions, my skill and toolbox will allow me to make something which expose the wood in a good way. I noticed how important it is to get enough epoxi on the fibers before sanding to get it totally transparent, how much gap allowed between ribs to get a good look and so on. "An open canoe for my mothers summerhouse would be nice"
Summer house, eh? You lucky dog! But then Swedes have those, don't they? The lucky dogs! But then I suppose there's no luck in it, just a well-balanced civil society and thrift. Nu har jag paddlat lite mer och börjar känna mig lite mer hemma i kajaken. Trots att min teknik inte är särskilt skolad är hon snabb i svängarna utan skädda men också väldigt kursstabil när man vill det, i regleringen av skäddan märker man skillnad på bara några millimeters utslag vid justering i sidvind. Packade veckopackning utan problem dock får man vara lite noga att jämt fördela vikten mellan för och akter men det gäller ju generellt. Detaljerna, luckor, fotstöd, sits och skädda är från kajaksport och det har inte varit några problen att justera in sittställningen. Now I paddled a little more and start to feel a little more at home in the kayak. Even though my technique is not particularly schooled , she is fast in the turns without skeg but also very stable course when you want it, in the regulation of skeg noticeable difference of only a few millimeters deflection at adjusting the crosswind . Packed weekly packing without problems , however, may be a bit careful to evenly distribute the weight between the bow and stern, but this is a matter generally . The details , doors, footrests , seat and skeg is from kayak sport and there have not been any problen to adjust its position .